Adds support for complex polygons. i.e. polygons with holes. Allows you to calculate a route and display it on the map. The route is draggable by default for easy customization. The instructions will also be nicely formatted. 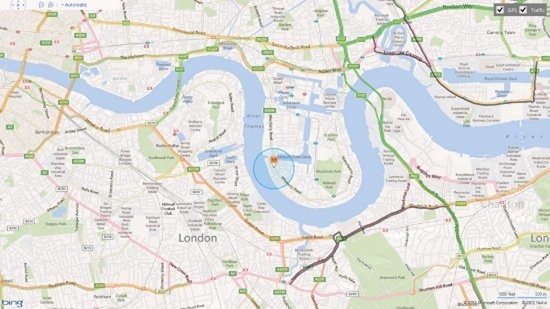 Modifies the navigation bar, pushpin and infobox look and feel to match the Bing Maps consumer site. Adds a traffic flow tile layer to the map. Exposes the Venue Map functionality and can be used to find nearby venue maps and load them. Venue Maps are interactive buildings on the map that often show the layout of a building. For instance, you can load a venue map of a mall and see were all the stores are located. In addition to the modules available through the Bing Maps control, there are a large number of community created modules also available on the Bing Maps V7 Modules CodePlex project. However, not all community created modules are designed to work with Windows Store applications; you may need to make some modifications to get them to work with your code. You can also create custom modules, which is a really great way to promote code reuse. 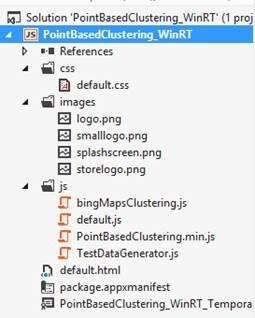 For the purpose of this post, we will build on top of the code we created in the Getting started with Bing Maps Windows Store Apps blog post. With some modules you may want to run code after the module has loaded. In this case, you can pass in a callback function as an option when loading the module. Doing the following will trigger a function called myModuleLoaded when the module has completed loading. Now that we understand how to use the module framework in the Bing Maps control, lets implement the traffic module in our application. To start, we will add a checkbox on the map for toggling the traffic layer on and off. First, open the default.html file and the checkbox to the same floating div that has our GPS checkbox. This time we are going to give the checkbox an id property. Since the traffic module is a built in module in the Bing Maps SDK we do not need to worry about registering it. We also don’t need to load the traffic module until the user presses the Traffic checkbox. To add the logic for traffic checkbox open the bingMapsIntro.js file and add a global variable called trafficLayer. Next, add a function called ToggleTraffic. In this function we will check to see the trafficLayer variable is implemented. If it is, then we can get the checked state from the traffic checkbox and show or hide the traffic layer accordingly. If the trafficLayer variable is not implemented we will need to load the traffic module and create an instance of the Microsoft.Maps.Traffic.TrafficLayer class after the module has loaded. By default, the traffic tile layer has no opacity to it and it ends up covering up the names of roads. To make for a better user experience we will get the base tile layer of the traffic layer and set it’s opacity to 0.5. Finally, after we created an instance of the TrafficLayer class we will want to rerun our logic for toggling the traffic layer. To do all this, add the following code into the bingMapsIntro.js file. //Load the traffic module and create the traffic layer. //Toggle the traffic layer to the current state of the checkbox. For more information on where traffic data is available see the Bing Maps Traffic Coverage section of the MSDN documentation. We have seen how to load one of the built in modules to our application, now we will look at how to implement a custom module. To do this we will make use of one of the community created modules called Point Based Clustering. This module will group pushpins together when zoomed out to make the map less crowded. This particular module uses a point based algorithm rather than a traditional grid based one. The point based algorithm gives use a much nicer user experience than the grid based algorithm, but there is a trade off in performance. With that said, this algorithm can easily handle 2,000+ pushpins. 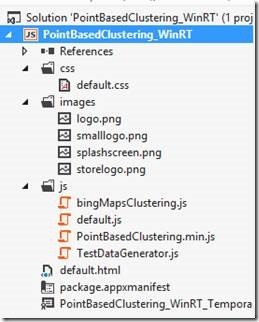 Now, open the bingMapsClustering.js file, add the following code to load the map, and register and load the Point Based Clustering Module. We will register our module right after loading the map in the GetMap function. We also need to add the RegisterModule functions so that we can dynamically load our custom module. This can easily be done by adding the following after the GetMap function. The last item here is to add the logic for handling the button click event by creating a function called RequestData. In this function we will need to get the users input value and pass it to the test data generator to generate our mock data. To simulate an asynchronous call to get our data, which we would likely do for a production application, our test generator takes in a callback function which it will call after it generates our mock data. We will name this callback function RequestDataCallback and have it populate our cluster layer with the mock data. The following can be added after the RegisterModule function in the bingMapsClustering.js file. Let’s run the application. In the textbox, enter the number of pushpins you would like to generate on the map and then press the button. 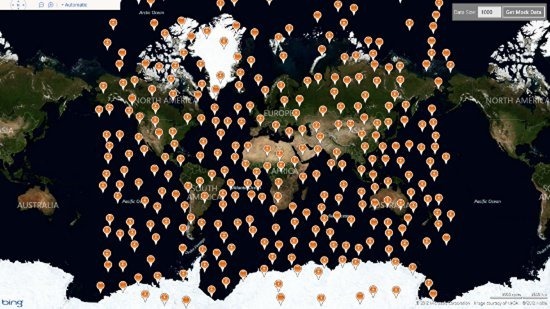 The following is a screenshot with 1,000 pushpins being clustered and rendered on the map. As you zoom in, you will notice that the clusters begin to break apart into their individual pushpins.